We invite you to explore India - the Land with infinite beauty ! Whether you soar high into Himalayas or peer under the ruins of the Ancient monuments dotting the landscape of India, you will cherish the experience long after your visit ! This India Travel Guide on Basilica of Our Lady of the Assumption is free from any commercial interest! This site is dedicated to promote India - the vast subcontinent, its glorious past, magnificent landscape and its infinite variety. 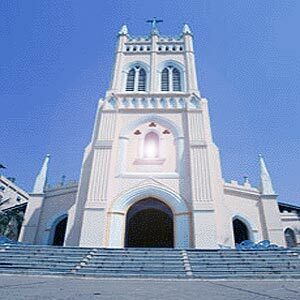 You will find St. Mary's Church along the busy stretch of Sarojini Naidu Road in Secunderabad. It owes its early history to Father Daniel Murphy along with Bishop Carew. St. Mary's Church was completed in 1950. This church was formerly called the Cathedral of the Archdiocese of Hyderabad. In 1886, it ceased to be a cathedral. In 1871, a few nuns from St. Anne at Turin came here and opened a school that is popular as St. Ann's school. St. Mary's Church bears resemblance to an old Irish Chapel. Curved arches and pointed buttresses are the hallmark of the St. Mary's church as also the four bells that were brought from Italy. It exhibits Gothic architecture from the outside but is relatively simpler inside. You can find stained glass windows and altars for Mother Mary and St. Patrick along with the main altar for Christ. Worshippers can meditate in quiet in the adjoining prayer room - St. Jude's Shrine. You can find a serene statue of Our Lady of the Immaculate Conception, with her hands joined in prayer. Weekdays: There is mass everyday at 6 pm. On Wednesdays, Fridays and Saturdays, there is Adoration after the Mass. On Thursdays, there is novena to Our Lady of Perpetual Help.